A fellow hunter called me while I was detecting in a town about 40 miles from Wichita. He told me he was going to hunt a new sidewalk tearout in downtown Wichita. I rushed back home and made it just as he was starting. 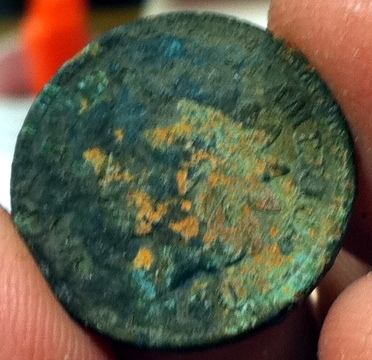 I only hunted for about an hour with him but I managed to pull my third Indian Head penny for the year. I never thought I’d find ONE IH in Wichita let alone three! The new addition to my IH collection is a badly corroded 1901 Indian Head. You can hardly see lady Liberty on the obverse. 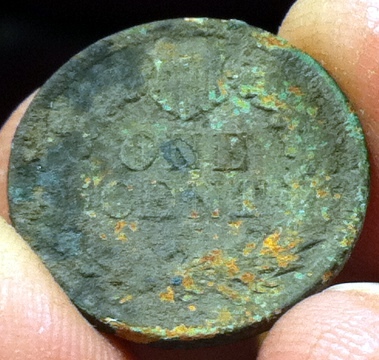 I can see 01 on the date and since there were no IH pennies in 1801, I can safely assume that the date is 1901. Hunting this tearout with a fellow hunter who is also an Police Officer has given me the courage to hunt other tearouts. This past Summer, I was too afraid to hunt a street tearout in one of the oldest neighborhoods in the city. I can only imagine the goodies I missed. Also, a little comment on the quality of my pictures. I have misplaced my tripod so I haven’t set up a good photo lab for my coins. Most of the pictures you see in this blog, have been taken with my cell phone. wow, those are good for cell phone pics, haha! grats on the Indians. Most of mine are chewed up like that, still looking for a really nice one.